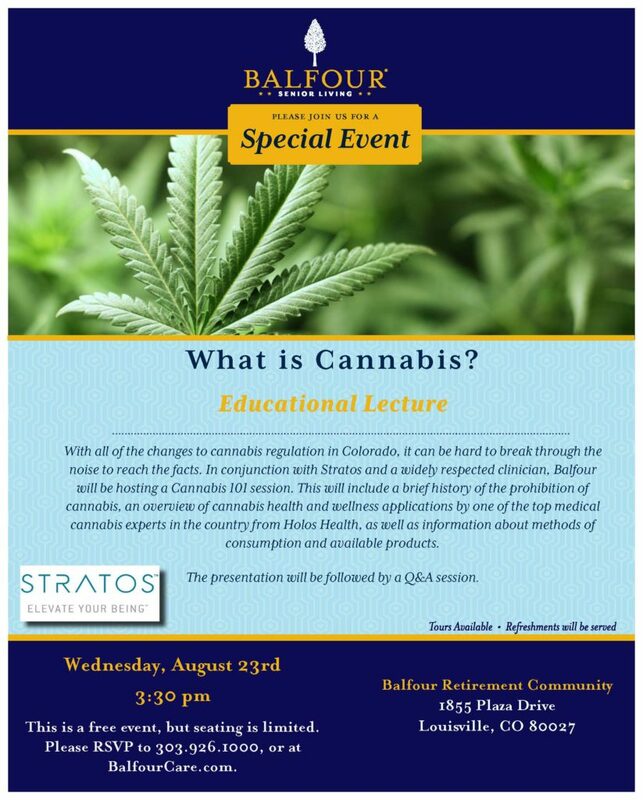 Balfour Senior Living is partnering with Stratos and Holos Health to deliver a Cannabis 101 educational series held at each of Balfour’s four locations throughout the Colorado Front Range. The free 45-minute presentations will discuss the medical benefits of cannabis and the positive health applications of marijuana for elderly persons. The presentation will be led by two of the leading medical cannabis experts in the country from Holos Health, a holistic health organization specializing in medical marijuana evaluations. They will lead a Q&A session following each of the presentations. With the evolution of medical cannabis, Stratos has created a pharmaceutical-grade cannabis tablet product line that uses FDA guidelines for accuracy, reproducibility, and cleanliness. This evolution has led to safe and effective dosing, allowing the benefits of medical cannabis to extend to a larger population, to include seniors. According to a national survey including 47,140 respondents, cannabis use among seniors has skyrocketed. Findings show that cannabis use has increased 57.8 percent for adults between ages 50 and 64 and 250 percent among adults over 65. The benefits of marijuana for elderly persons include pain management and extend to treatment for ailments like macular degeneration, chronic fatigue, depression, arthritis, and sleep disorders. The Cannabis 101 series is a great opportunity to share information with the senior community about the medical benefits of cannabis so they can determine if it fits into their health care regimen. Space is limited, and guests are encouraged to RSVP by calling the community directly or visiting www.BalfourCare.com. For more information on Balfour Senior Living’s independent living, assisted living, memory care, and skilled nursing care accommodations call (844) 354-8877.